Italian Foreign Minister Giulio Terzi has resigned in protest of his government's decision to send two Italian marines, accused of killing two Indian fishermen, to Delhi for trial. The case sparked a major diplomatic row between India and Italy. "My reservations about sending the marines back to India were not listened to," Mr Terzi told Italian MPs. Prime Minister Mario Monti said he was "astonished" by the decision. He is due to speak in parliament on Wednesday. 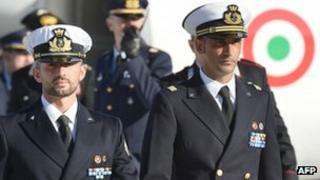 Massimiliano Latorre and Salvatore Girone are charged with shooting the fishermen off the Kerala coast in February 2012. They said they mistook them for pirates. The accused were shuttled back and forth between Italy and India in recent months while the two governments argued over the legal consequences of an alleged crime committed in international waters, the BBC's David Willey, in Rome, reports. Italy then announced last week that it would send the marines back to Delhi to stand trial. On Tuesday, Mr Terzi said he was resigning because his voice had gone "unheard" by Prime Minister Monti and his caretaker administration. "I can no longer be part of this government," Mr Terzi said. "I am resigning because I have maintained for 40 years and I maintain more forcefully today that the honour of the country, its armed forces and the Italian diplomacy must be safeguarded. I am resigning because I support the two marines and their families." Mr Monti responded to the resignation with surprise. He said he had met Mr Terzi earlier on Tuesday and the foreign minister had not mentioned his intention to quit. Meanwhile Defence Minister Giampaolo Di Paola said he would not step down over the crisis because he did not want to "abandon a ship in difficulty". "I have always acted for the good of the marines and Italy. If I haven't managed that, I ask forgiveness from everyone, and first of all from both of them," he told MPs shortly after Mr Terzi's announcement. "It was me who told them about the decision to return them to India, I looked them in the eyes and told them." The marines had been guarding an Italian oil tanker when they killed the fishermen last year. The Indian government had allowed the men to return to Italy to vote in last month's election. But when they failed to return, India's Supreme Court ruled Italy's ambassador was barred from leaving the country. In response, the Italian government said last Thursday the marines had agreed to return to Delhi following a meeting with Mr Monti and other ministers. The diplomatic dispute comes as Italy battles a political crisis after last month's inconclusive election result.